For years, my grandmother had an old cast iron stove stored in her shed, disconnected & looking sad for itself. About 70cm deep, near enough the same total height, and half as wide, it is a compact little unit. She brought it with her when she moved to her then home in the 1980s and never had it fitted - apparently it was quite labour intensive to clear out the ashes after a fire was a discouraging factor. I also suspect easier modern-conveniences in the newly built house such as oil fired central heating & gas cookers played a role in it's demise. Twin plates - tea at the back, popcorn at the front? I was always interested in this stove - I love restoring to their former glory old items of industry. 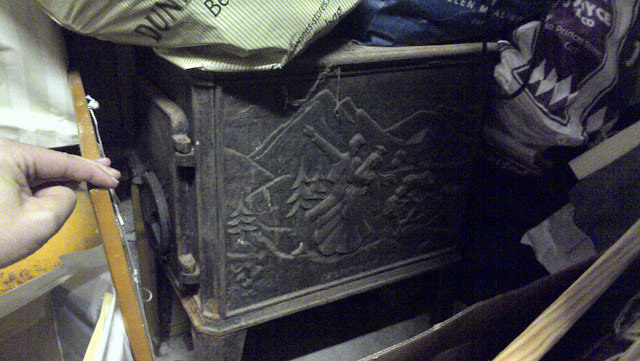 After threatening for years to take the stove home with me, Granny forced my hand by having it thrown from her shed to the back garden awaiting a trip to the local dump. Back of the car it was, newly acquired rust and all! I had never worked with cast iron really beyond my secondary school weekly classes (and even then it was more mild steel, in a good dry environment). I was going to need some education in how to bring back the metal from rust. The brushing is working, albeit quite slow..
At this juncture, it might be good to expand a bit on the history of this model stove, a Trolla 104. A contemporary equivalent would be the Jøtul F 604 which sports a cosy 8.5kW heat output - not bad for a compact room. The Trolla company no longer exists - according to this post they were bought out in 1980 by Jøtul, and their manufacturing site is now home to a biker gang - metal indeed! 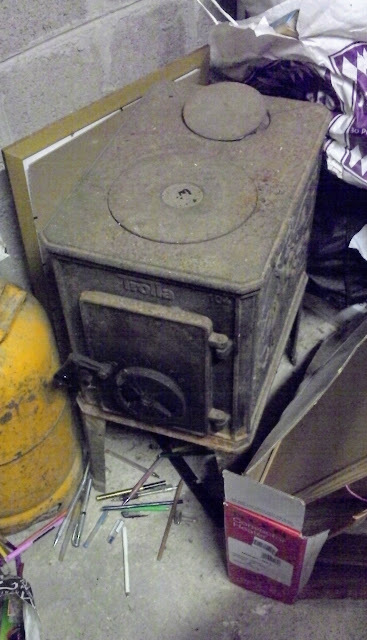 According to this post, the Trolla stoves were imported to the UK (and so, I'm guessing by extension to Ireland) to make use of timber due to Dutch Elm disease in the 1970s & 1980s. For sure, there are plenty of examples of the Trolla 104 out there for sale - it seems quite common. 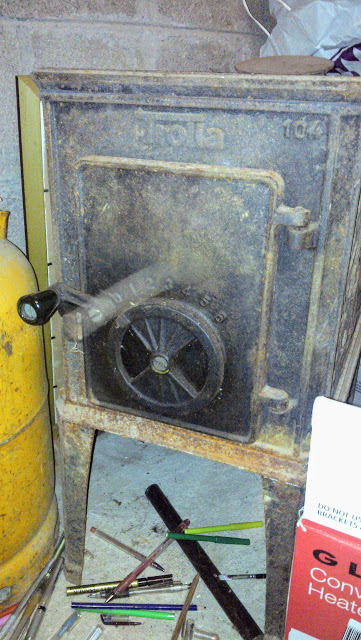 I harbour an ambition to put this stove back to it's original working state. But I know in my current house, space-wise it is probably unlikely to work, plus the expense of getting the chimney lined & fireplace re-modelled versus how long we will keep on owning the house. So for now, I want it to look good and usable for storage, and later, will want to burn in it. That means all the consumables used to re-assemble should be suitable for burning in. I used VITCAS Heat Resistant Paint in silver colour to brighten up the interior. And some Fire Cement to seal up all the gaps. Some research into the relief scene cast into the side was conducted, with surprising results. The word Bruderov is visible at the bottom, leading to this interesting article on Wikipedia about Bride Kidnapping - sounds like it's a big part about Norwegian culture! No longer a pokey little cupboard!